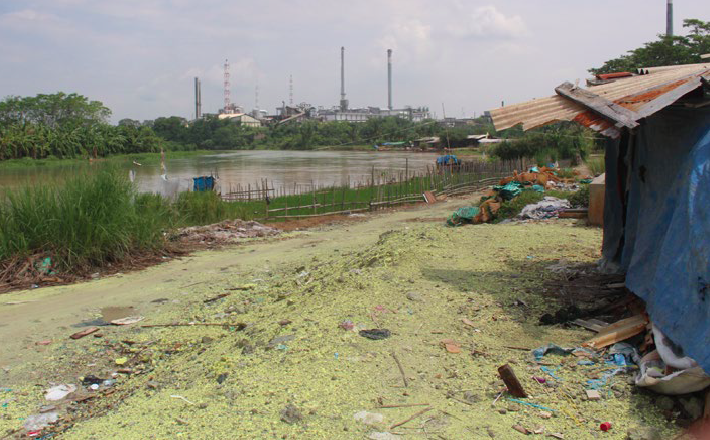 The largest viscose plant in Indonesia may pose serious health risks for plant workers and local residents through toxic processes, air pollution, water pollution, and suspected illegal dumping of toxic waste. Background: Viscose (or rayon) has often been marketed as a more ecologically sustainable alternative to polyester because unlike polyester which is made from petrochemicals, viscose is made from cellulose. It is also praised by some fashion brands because it requires less water to produce compared with cotton. Viscose is found in a huge variety of clothes and is used by almost every major fashion brand to some extent. Although not inherently unsustainable, it is the production process of viscose that presents a very problematic story. Basically, wood pulp is extracted from wood, then turned into viscose staple fibre (VSF) and filament yarn through a highly chemical process using carbon disulphide. Viscose production faces a three pronged issue: the risk of deforestation of ancient forests, occupational hazards of factory workers who are exposed to highly dangerous toxins that have been linked to neurological damage, and heavy contamination that results from poor waste management of viscose factories, not only polluting nearby waters and air, but causing widespread illnesses to villagers in the vicinity of factories . 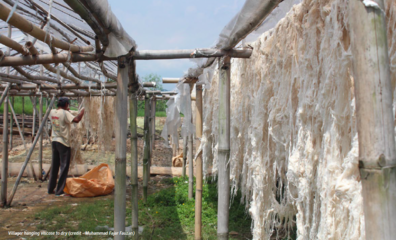 Indonesia produced 439 billion tonnes of viscose fibre in 2016 . The PT Indo Bharat Rayon plant is the biggest viscose factory in Indonesia and the second largest in the world . It is owned by the Indian conglomerate Aditya Birla, and well known brands that source their viscose from them include H&M (Sweden), ASOS (UK), Marks & Spencer (UK), Tesco (UK), Zara/Inditex (Spain), Levi’s (US) and United Colors of Benetton (Italy) . Indo Bharat Rayon (IBR) “produces viscose staple fibre, anhydrous sodium sulphate and sulphuric acid” . The plant is nearby Citarum river, which has been the centre of many textile factory related pollution disputes (https://ejatlas.org/conflict/pt-kahatex-pt-insan-sandan-internusa-and-pt-five-star-textile) and about 7km outside Purwakarta city, with several villages surrounding the plant . Mobilisation and Resistance: On 2 January 1999, workers and local residents protested against IBR due to heavy air pollution caused by the Purwakerta plant . It was a violent mobilisation with protesters breaking into the vicinities of the viscose plant, burning down the gate and breaking windows. The protester demanded compensation for the residents who suffer from heavy sulfur gas odours coming from the viscose factory . The nearby PT South Pacific Viscose plant was also attacked on the same date. In March 2011, “Wahana Pemerhati Lingkungan Indonesia (WAPLI), a NGO based in Purwakarta, Indonesia, filed a complaint after IBR illegally dumped coal waste, including fly ash, into what was a lake behind the factory, right alongside the Citarum River.” . IBR was found guilty of these charges in June 2016 and the company was fined approximately €673,000 with the CEO potentially facing prison time . Despite this legal action, WAPLI argue that IBR have not implemented changes to rectify this situation. 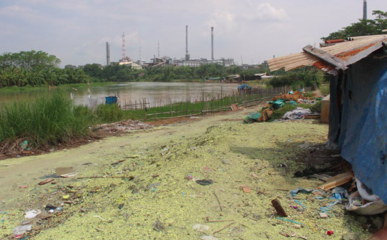 Changing Markets investigators observed yellow particles along the Citarum river which are believed to be sulphur waste from IBR. both villagers and NGOs believe IBR is dumping this waste at night when no one is looking . Environmental and Health impacts: Investigators from Changing Markets visited the area where IBR was found to have illegally dumped coal waste, which is now largely a rice paddy. This is potentially highly dangerous, particularly as the farmers do not seem to have been informed of the risks of farming on such contaminated land . The Changing Markets investigation team also visited some nearby villages: Kampung Sawah, Desa Cilanap and Kecamatan Babak Cikao. Through interviewing local residents they were made aware that the pollution, which causes a terrible smell also causes locals to get sick. They also found open bags of viscose fibres both from IBR and PT South Pacific Viscose. It is believed that the villagers are employed as “intermediaries” by the viscose companies to wash the viscose in the river (which was seen being done sans protective gear), which poses potentially serious health hazards to the villagers and pollutes the river . Today there seems to be no fishing activity in the Citarum river around these villages as it has become uneconomical, furthermore villagers told investigators that nobody swims in the river anymore either . viscose staple fibre, anhydrous sodium sulphate, sulphuric acid. Project Details Indo Bharat Rayon began operations in Indonesia in 1974, and the Purwakarta plant opened in 1982. The IBR plant was expanded in 2015 to increase plant capacity for viscose staple fibre (VSF) and sulphuric acid. The expansion cost roughly USD $60 million. IBR was found guilty of charges in June 2016 and the company was fined approximately €673,000 with the CEO potentially facing prison time . Despite this legal action, WAPLI argue that IBR have not implemented changes to rectify this situation. Why? Explain briefly. The IBR plant is still in operation and there have been no observations or proof of improvements in their waste management or toxic production processes. World Socialist Website 1999, Workers Struggles: Asia, "Hundreds attack two factories for environmental pollution", 9 January 1999.